Doesn’t it seem, every year, in a blink of an eye it’s July 4th?! I decided to get ahead of the game this year. 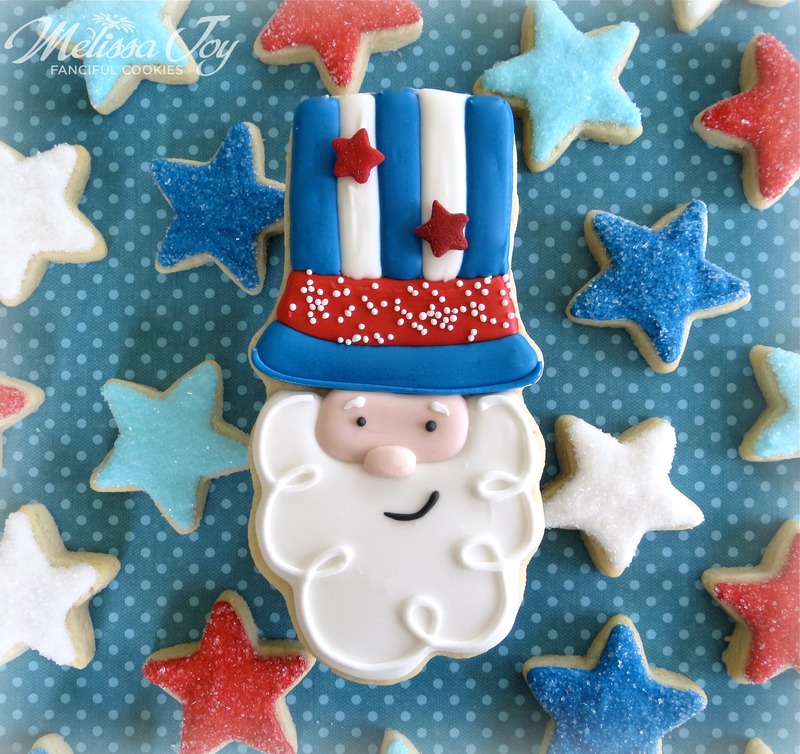 I spotted a few Uncle Sam items in the craft stores months ago and tucked that little bit of inspiration away for future cookies. See? It’s not such a bad thing they get the decor out WAY too early. While many scoff at this insane notion to stock shelves with holiday merchandise LONG before it’s appropriate, I am snapping pictures with my phone and making mental notes for cookies. It’s a sickness, this baking addiction. 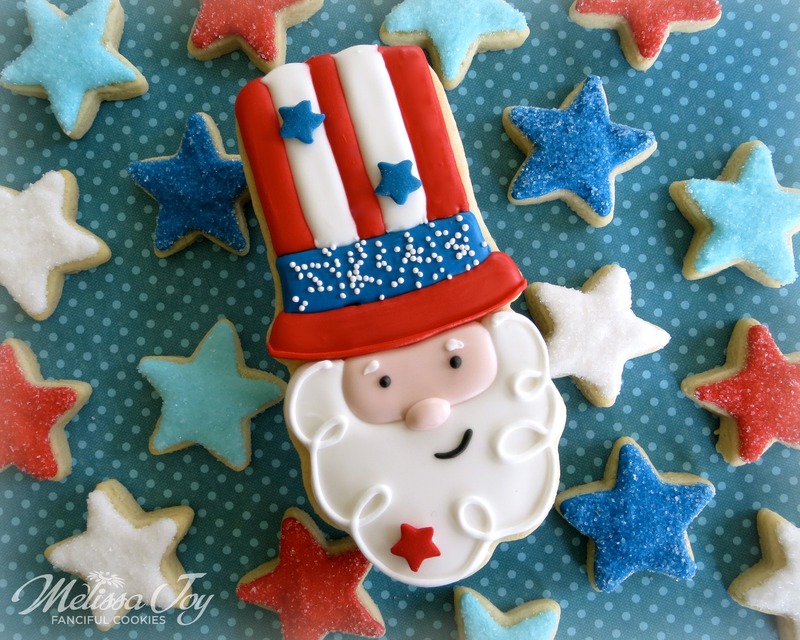 I am feeling that in the cookie world, old Uncle Sam could be the new trend for the 4th of July holiday. Like sweet Mrs. Claus was this past Christmas, after this awesome creation by Sugared Hearts Bakery made the Facebook rounds. 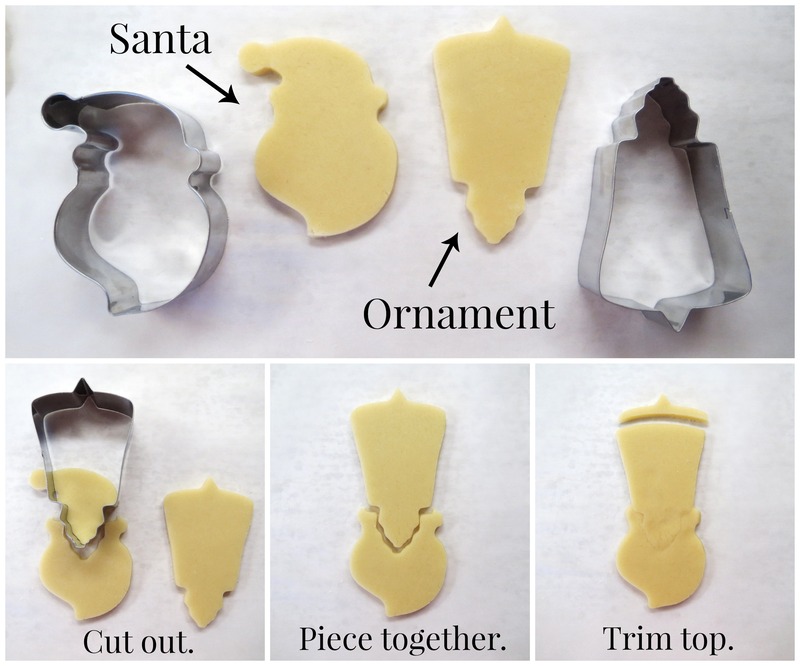 It inspired many of us cookie peeps to make a version of their own. Me included! But, we’re not talking Christmas in July here, we are talking actual JULY. 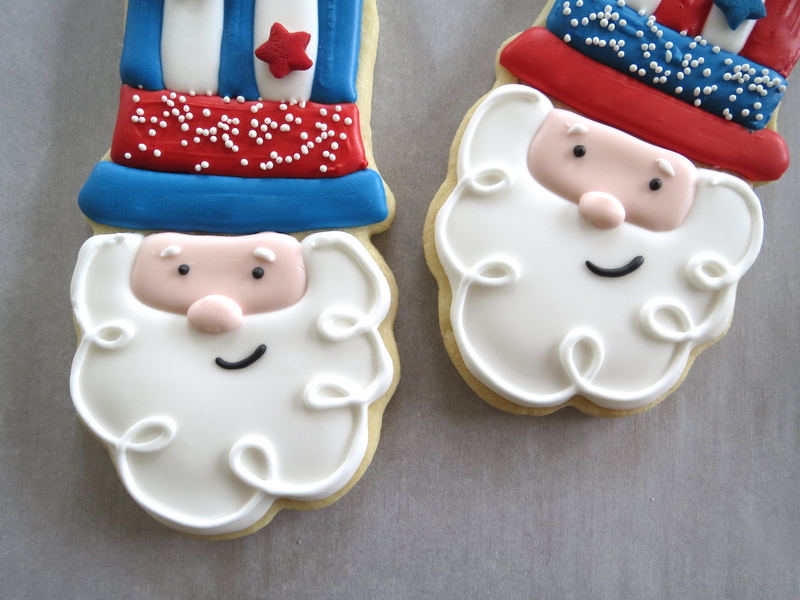 Though I did use Santa cookie cutters to make Uncle Sam….so maybe we are…it’s a blurred line. Here’s a little info on how I created my man, Uncle Sam. I created two versions, one with a few less steps than the other. Let’s start with the bigger guy! These are the cutters I used to get the desired shape I had in mind. 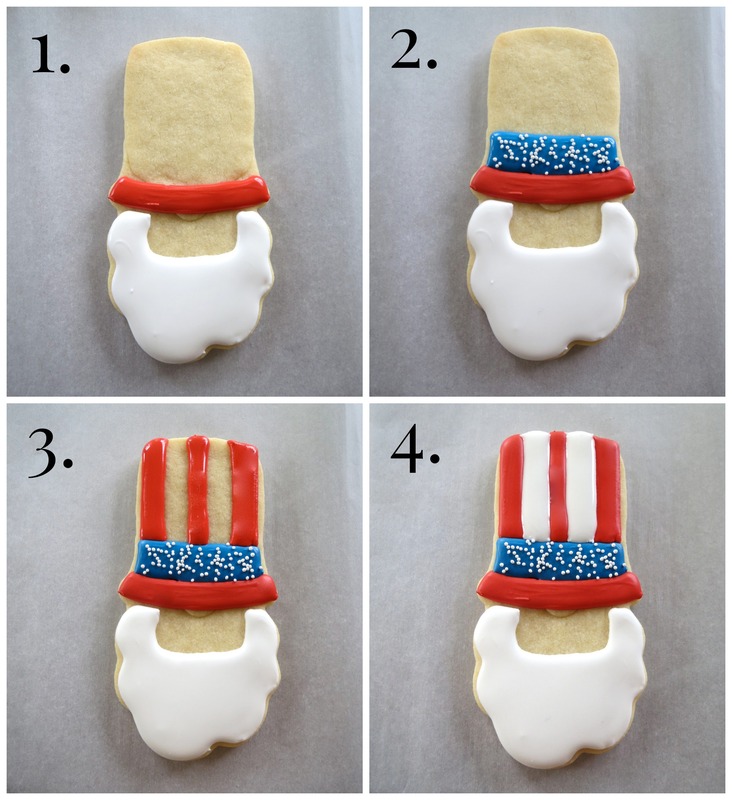 Think big beard and tall hat, then dig through your cookie cutters for the right look. Decorate as shown above. I let each section dry a bit before moving on to the next. Add face and feature details. I added a few star sprinkles to make it extra festive. This design was one I wanted to try based on the Santa Gnomes I made this past Christmas. Again, I let the icing dry a bit before moving on to the next section. Add a nose after these steps are done. Let him sit overnight so he’s dry enough to add the hat decoration, using a food coloring marker. This specific brand of marker is made by Ateco, which has a wider tip than my usual favorite, the FooDoodler. 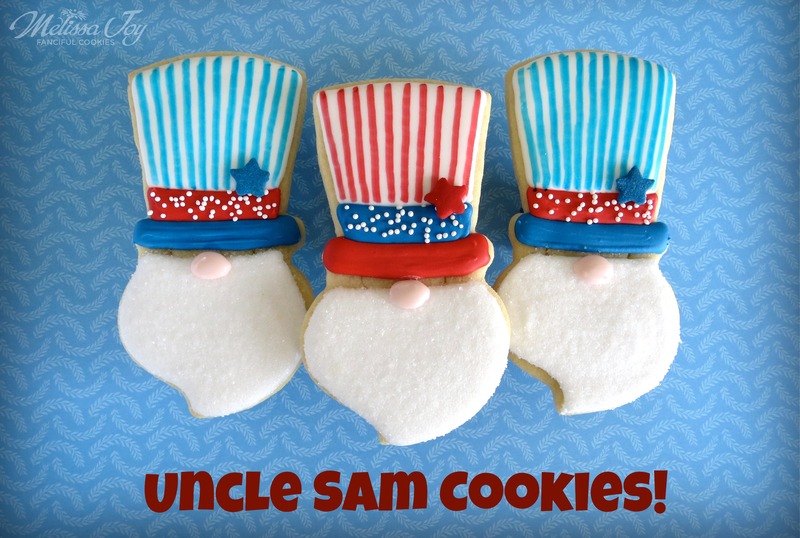 Little Uncle Sam cookie! Not sure which version I like better…but it’s like with your kids, you can’t play favorites. Looking for more Independence Day cookie ideas? 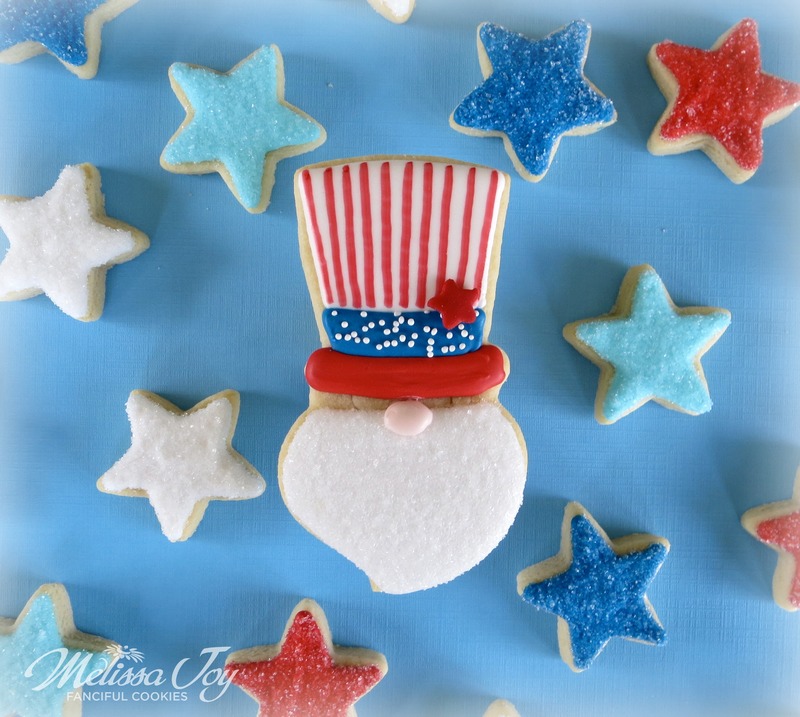 Check out my bunting cookies, stars & stripes cookies, or cookies for the troops from the Melissa Joy archives. 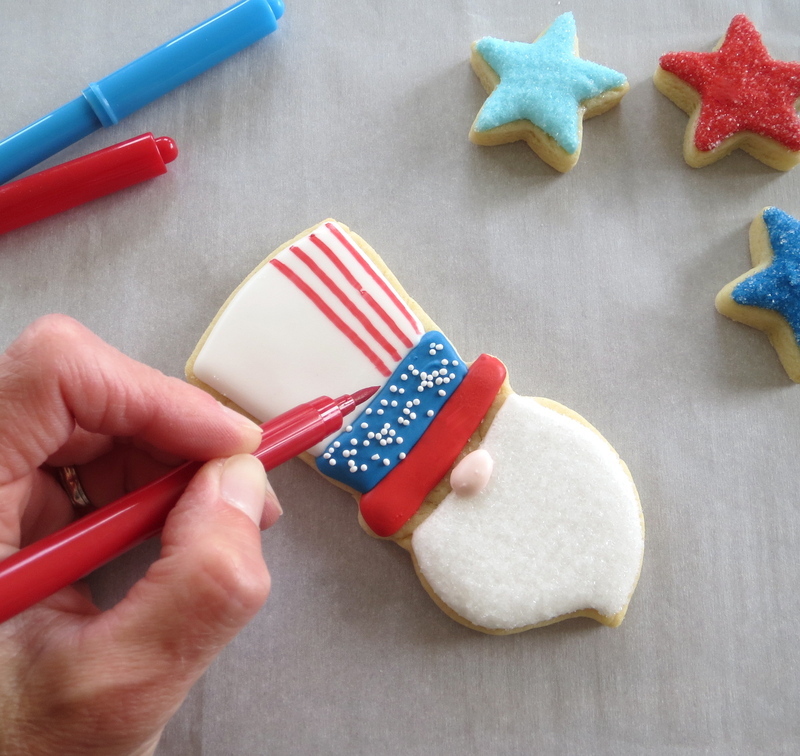 This entry was posted in Cookie Tutorials, Cookies for Kids, For Fun Cookies, Fourth of July Cookies and tagged Christmas in July, fourth of july cookies, Melissa Joy Cookies, Uncle Sam, Uncle Sam Cookies. Bookmark the permalink. Your creativity is magic, and the results, divine! Thanks for taking the time to chronicle the steps for all. Oh Nancy, thanks so much! These are sooo cute. I as in Hobby Lobby, and they were putting out Christmas stuff….wow..just wow. We would love for you to join us at Party in Your PJs. Link party. Thanks! Hobby Lobby is the inspiration for my Uncle Sams. 🙂 I would love to link up these…will head over now! NEVER has Uncle Sam been so CUTE!